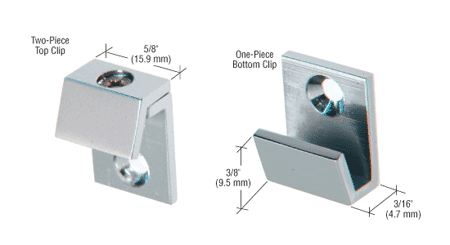 The 5/8" (16 mm) Wide Metal Beveled Mirror Clips are specifically designed for 1/4 inch (6 millimeter) beveled mirror. They simplify the process of installing mirrors by using the one-piece clip on the bottom and the two-piece clip on top for a quick and easy installation. The upper clip is removable by unscrewing the top screw. Supplied with #6 x 3/4 inch (19 millimeter) Flat Head Wood Screws and Plastic Anchors. Set includes 2 top and 2 bottom clips.